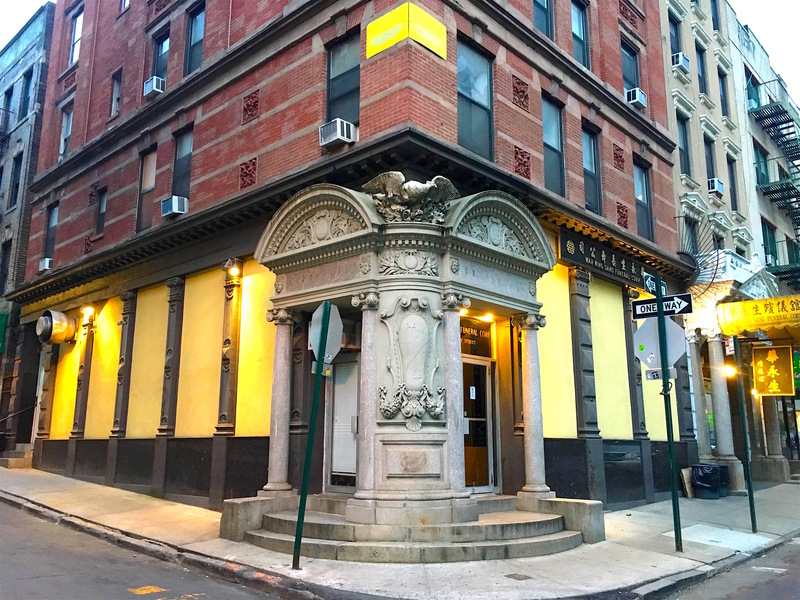 I’ve always been curious about the formidable entrance of this ordinary brick building at Mulberry and Mosco Streets in Chinatown. This corner has an illustrious past. For much of the 19th century it was a particularly dicey part of the old Five Points slum known as Mulberry Bend (below, at the point where this former cow path literally bends). By the turn of the 20th century it was a central part of the teeming “Italian Colony,” as some called it, aka Little Italy. The building entrance is designed to communicate strength and power: marble columns, terra cotta ornamentation, steps that elevate visitors above the sidewalk, all topped by a mean-looking eagle with wings spread, ready to take flight. What was this Greek temple–like entrance for, exactly? A bank. Number 28 Mulberry was once the doorway for the Banco Italia, which in 1881 served the growing Italian immigrant community pouring into Mulberry Bend. 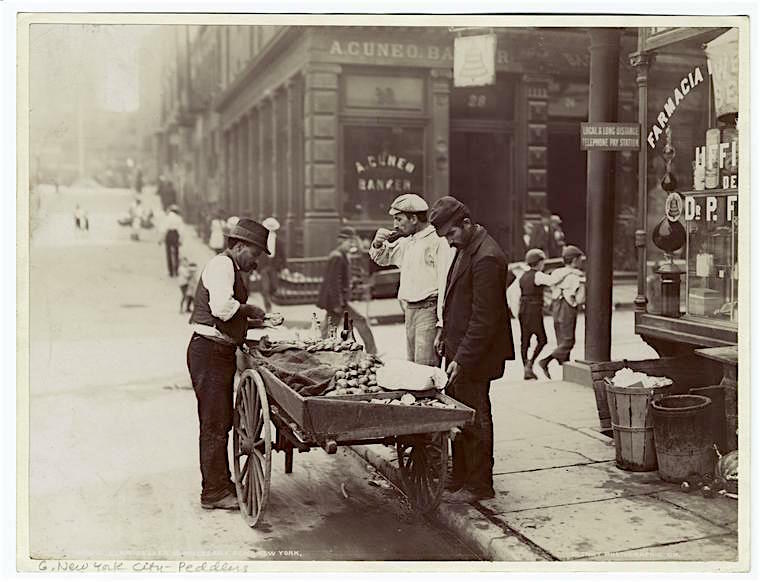 Cuneo made his money first by selling nuts and fruits from a pushcart, operating a grocery store and fruit importing concern that made him the city’s “banana king,” then buying up real estate. Though Banco Italia’s showstopping doorway may have convinced many newcomers to open accounts there, Cuneo was something of a shady character. 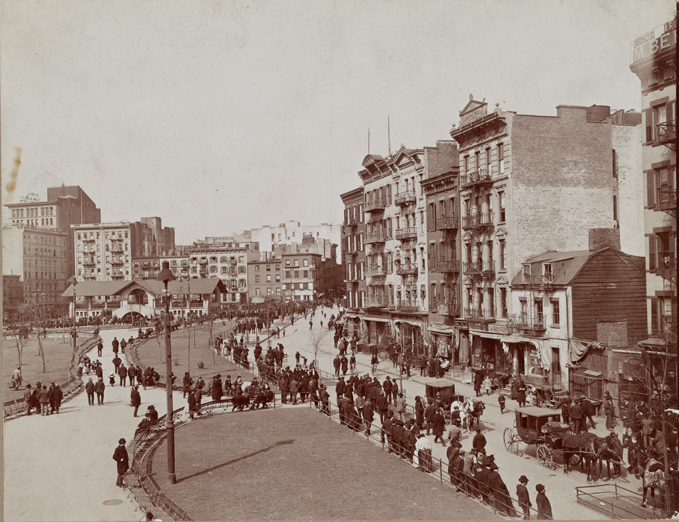 “In 1887, a United States Congressional investigation found that the bank operated under a padrone system, a labor arrangement where the bank, for a fee, operated an agency in Naples that coordinated prepaid steamer tickets and requests for underpaid labor,” states The Big Onion Guide to Historic New York City. This didn’t diminish Cuneo in the eyes of his community. 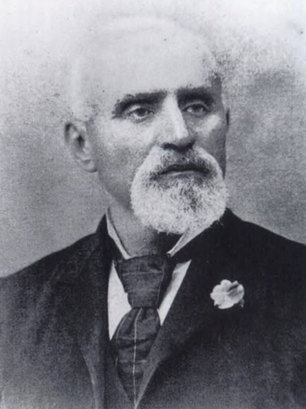 When he died in 1896, hundreds packed St. Gioacchino’s Church on Roosevelt Street. An overflow crowd of mourners on the street was so large, a police detail was brought in. 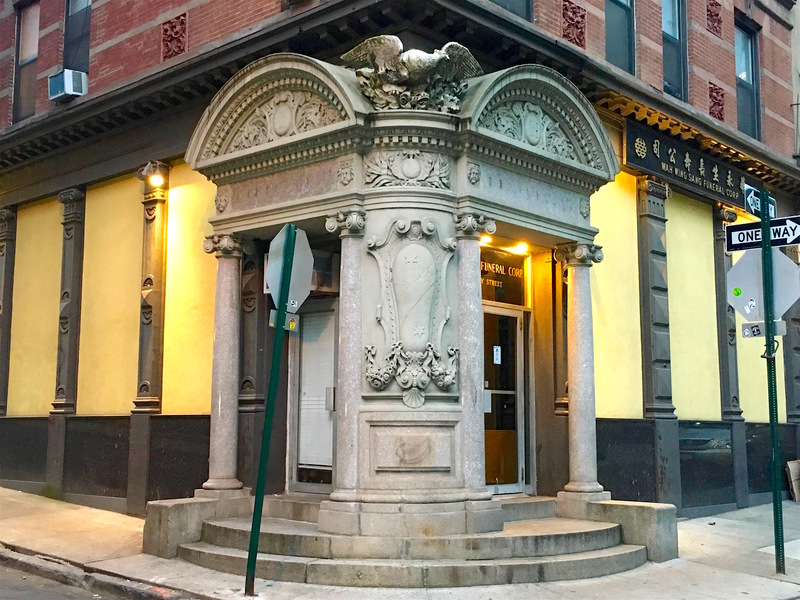 The bank now houses a funeral home, and the ornate entrance seems strangely appropriate.